Symbian might be dead in the long term, but in the short term Nokia still plans to sell some 150 million handsets with the operating system and for all current Nokia users an updated interface might mean a whole new experience. 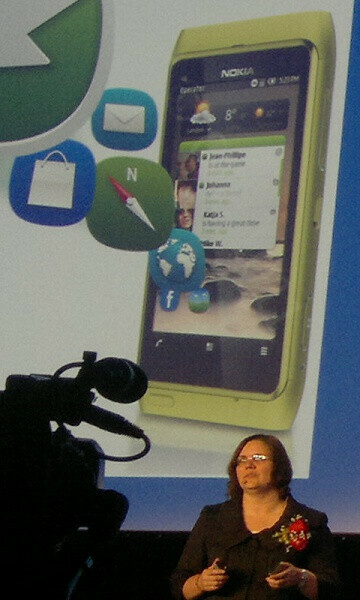 Yesterday's Nokia presentation gave a peek into that with a preview of the new Symbian homescreen layout. Demonstrated on Nokia's current flagship, the Nokia N8, the new UI looks much more compact with a thinner status bar looking similar to the one on Android. The call menu on the bottom has also become much slimmer, while in the middle, widgets no longer look cramped. However minor this update might seem, it gives a refreshed contemporary look to Symbian^3. The new interface might help Nokia in its attempt to push 150 million more Symbian handsets in the near future, but its a shame that such developments come when the platform is in the process of getting abandoned. at last, ! they changed it !!!!! 150 million lolz Nokia you must be dreaming or something if you want to sell 150 million symbian 3^ phones Nokia you have to drop the price of the phones for 90% so the n8 right now costing around 450$ so the price going down to 40$! Why do they continue to make things smaller and smaller in the UI, when what they need to be doing is making them more touch friendly? Nokia hasn't learned anything yet. I prefer Android, sweet Samsung galaxy S II smart phone, but i more prefer have in my pocket phone with best phone camera sensor. So my next smart phone - Nokia N8, coz for me must important - best photo quality. I don't like to carry with me my big Canon photo camera. Hopefully this update includes an overhaul to the browser. Currently own a N900, the only thing holding me back from purchasing an E7 whenever its released is the web browsing experience. Will be purchasing a Samsung Galaxy S 2 upon release otherwise. Regarding complaints about the price...over here at least the N8 is way cheaper(on contract) than the iPhone 4 or the latest Androids. I paid €109 for it on the 'lowest' price plan and the phone has dropped in price since, it is now around €69. HTC Desire HD is €200, iPhone 4 is still €279!!!! The UI may not be as good but hardware & price included it must be the best value for money phone on the market (in my humble opinion).